Akhtar at the 2012 Texas Book Festival. 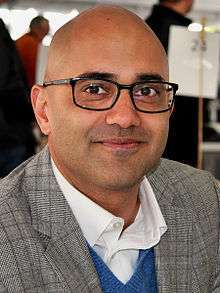 Ayad Akhtar (born October 28, 1970) is a Pakistani American playwright, novelist, screenwriter and actor who is best known for his play, Disgraced. The play received the 2013 Pulitzer Prize for Drama, was nominated for a Tony Award for Best Play, and was named the most produced play in America for the 2015-16 Season. Akhtar's work covers various themes including the human condition, love, responsibility, relationships, the American-Muslim experience, economics, immigration, identity, and aspects of culture. Akhtar was born in Staten Island, New York City and raised in Milwaukee, Wisconsin. Akhtar's interest in writing was initially sparked in high school, when a teacher introduced him to European Modernism. Akhtar graduated from Brookfield Central High School in 1988 and later attended Brown University where he majored in theater and began acting in student plays. After graduation he moved to Italy and studied acting with Jerzy Grotowski for a year, eventually becoming his assistant. Upon returning to the United States, Akhtar taught acting classes with Andre Gregory and earned his Master of Fine Arts degree in film directing from Columbia University School of the Arts. While at Columbia he and classmates Tom Glynn and Joseph Castelo formed the idea for The War Within, a 2005 film about an ordinary man radicalized into becoming a terrorist. Akhtar starred in the film playing Hassan, the would-be terrorist. In 2011 he played Neel Kashkari in the HBO film Too Big to Fail. Akhtar published his first novel, American Dervish in 2012, a coming-of-age story about a Pakistani-American boy, Hayat, growing up in Milwaukee. The book was met with critical acclaim, described by the New York Times as "self-assured and effortlessly told." American Dervish marks the first in a seven-work cycle on the Muslim-American experience that will include one film, three novels and three plays. Of which one novel (American Dervish) and all three plays (Disgraced, The Who & The What, The Invisible Hand) have been completed. In 2012, Akhtar returned to the theatre to write his first play, Disgraced. The play premiered at The American Theater Company in Chicago before serving as the inaugural production of the new LCT3/Lincoln Center in New York. The play went on to win the 2013 Pulitzer Prize for Drama and received a London premiere at the Bush Theatre in London. A new production of the play opened on Broadway at the Lyceum Theatre on October 23, 2014. The Broadway production was nominated for the Tony Award for Best Play in 2015. Akhtar had two subsequent plays produced, The Who & The What, which premiered at La Jolla Playhouse in February 2012 and The Invisible Hand at Repertory Theatre of St. Louis in March, 2012. The Who & The What received its New York premiere in May, 2014 at LCT3/Lincoln Center Theater followed by the New York premiere of The Invisible Hand at New York Theatre Workshop in December, 2014 These successes led American Theatre magazine to name Akhtar the most produced playwright of the 2016-17 Season, with 18 productions of Disgraced nationwide and 21 productions total. Akhtar's new play is Junk: The Golden Age of Debt. Set in the eighties, it puts a corporate takeover onstage. The play received its world premiere at La Jolla Playhouse in the summer of 2016. 2012 Nomination for the Steinberg/ACTA Best New Play Award for "The Invisible Hand"
1 2 3 "The 2013 Pulitzer Prize Winners". 1 2 3 Staff, Variety (2015-04-28). "Tony Nominations 2015: Full List". Variety. Retrieved 2016-05-02. 1 2 "The Top 10 Most-Produced Plays of the 2015--16 Season". AMERICAN THEATRE. 2015-09-16. Retrieved 2016-05-02. ↑ Feldberg, Robert. "Ayad Akhtar expects audience discomfort with his play 'Disgraced'". NorthJersey.com. Retrieved 2016-05-02. 1 2 Wagner, Annie (October 19, 2005). "Annie Wagner Talks to Ayad Akhtar and Tom Glynn". The Stranger. Retrieved May 31, 2011. ↑ Pais, Arthur J. (October 6, 2005). "What goes on in a terrorist's mind". Rediff. Retrieved May 31, 2011. ↑ Dudek, Duane (May 19, 2011). "Akhtar finds new opportunities in fiction, HBO". Milwaukee Journal Sentinel. Retrieved May 31, 2011. ↑ Alter, Alexandra. "'Dervish' Whirls Into Publishing World". WSJ. Retrieved 2016-05-02. ↑ "Review: 'Disgraced' at American Theater Company". tribunedigital-chicagotribune. Retrieved 2016-05-02. ↑ Jones, Chris (Jan 21, 2012). "Tolerance is no easy out in riveting 'Disgraced'". Chicago Tribune. ↑ "Disgraced". www.bushtheatre.co.uk. Retrieved 2016-05-02. ↑ "Disgraced @ Lyceum Theatre | Playbill". Playbill. Retrieved 2016-05-02. ↑ "Production History". www.lajollaplayhouse.org. Retrieved 2016-05-02. ↑ "The Invisible Hand: The Repertory Theatre of St. Louis: Production History Detail". www.repstl.org. Retrieved 2016-05-02. ↑ Theater, Lincoln Center. "The Who & The What | Lincoln Center Theater". Lincoln Center Theater. Retrieved 2016-05-02. ↑ "NYTW / The Invisible Hand". NYTW. Retrieved 2016-05-02. ↑ "The Top 20 Most-Produced Playwrights of the 2015--16 Season". AMERICAN THEATRE. 2015-09-15. Retrieved 2016-05-02. ↑ "JUNK: The Golden Age of Debt". www.lajollaplayhouse.org. Retrieved 2016-05-02. ↑ Akhtar, Ayad (2015-08-25). The Invisible Hand. Back Bay Books. ISBN 9780316324533. ↑ Akhtar, Ayad (2014-10-07). The Who & The What: A Play. Back Bay Books. ISBN 9780316324496. ↑ Akhtar, Ayad (2013-09-10). Disgraced: A Play. Back Bay Books. ISBN 9780316324465. ↑ "Little, Brown and Company Fall '11/Winter '12" (PDF). Little, Brown and Company. May 10, 2011. Archived from the original (PDF) on August 29, 2011. Retrieved May 31, 2011. ↑ "OBIE Award Winners Announced". www.obieawards.com. May 18, 2015. Retrieved May 1, 2016. ↑ "AWARDS FOR 2014-2015". outercritics.org. Retrieved 2016-05-02. ↑ "The Invisible Hand - Lortel Archives". www.lortel.org. Retrieved 2016-05-02. ↑ ""Six Finalists Named For Steinberg/ATCA," nation's largest new play award". ↑ Gans, Andrew (May 13, 2013). Is Big Winner of 2012-13 Outer Critics Circle Awards "Pippin Is Big Winner of 2012-13 Outer Critics Circle Awards". Playbill. Retrieved May 13, 2013. ↑ Gans, Andrew (2013-05-21). "Natasha, Vanya and Sonia, Closer Than Ever, The Piano Lesson and More Win Off Broadway Alliance Awards". Playbill. Retrieved 2013-05-22. ↑ "Jeff Awards" (PDF). Jeffawards.com. Retrieved May 1, 2016. ↑ "Best Fiction of 2012 | Kirkus Reviews". Kirkus Reviews. Retrieved 2016-05-02. ↑ "The Globe's top 29 picks for international fiction of 2012". The Globe and Mail. Retrieved 2016-05-02. ↑ "Shelf Awareness for Readers for Friday, December 28, 2012". www.shelf-awareness.com. Retrieved 2016-05-02. ↑ Noble, Barnes &. "O, The Oprah Magazine's Best Books of 2012, Best Books of the Year 2012, Books". Barnes & Noble. Retrieved 2016-05-02. ↑ King, Susan (November 30, 2005). "Getting into the Spirit of awards season". Los Angeles Times. p. E3.